Well if the fishing has’nt been much good we have been very lucky with some amazing weather over the past month. I cant remember the last good rain we got which has resulted in our rivers being fairly low and clear making fishing hard and challenging for most. The Tongariro is the dark horse and is flowing at double flow for the next week or so and should hold best numbers of trout with fresh fish trickling inÂ most nights. The river mouths have been fishing well so they must be close to pushing through and it will be just a case of being in the right spot when they do. 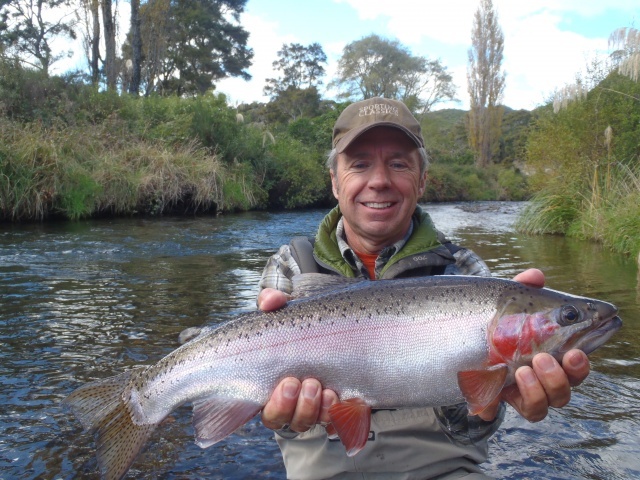 The Tongariro once again has proved hard for me this last week with only a few average fish caught but I expect this river to fire the best when they feel the urge to run with the extra flows. I have heard good reports from other anglers that have caught some very solid fish in the last few days but they certainly have done well keeping away from me and clients. Angling pressure has been fairly high on this river by 10am but there does’nt seem to be too many early birds out and about so if your thinking of getting out go early! I had the pleasure of fishing with Tom this morning which lives in Montana but has been shooting Elk, Red Stag, Chamois, Tahr and Fallow Stag in the South Island. 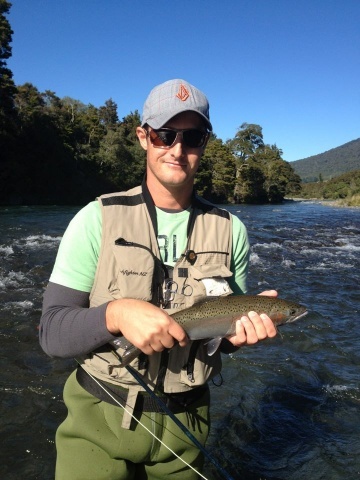 Tom only had a half day to fish with me which was a real shame as he was a very skilled angler with some great luck. I picked Tom up at 7am so we had a fairly early start on the rivers and should beat most other locals and guides to my preferred spots. Tom said he only wanted to land one fish for a photo to take home so he was always going to be a pretty easy to please client. 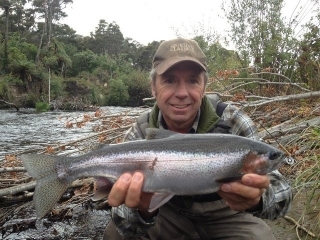 The Hine is still very low and clear with weed on every rock but I knew the odd fish had been coming through here from the lake so it was worth a quick flick in my best pools in hope that I would’nt have to travel to turangi to find that one fish. Tom was a great angler which listened toÂ advice and soon was in a tangle with his first silver bullet which stormed of down the straight and broke the leader-“don’t worry Tom probably my knot” yeah right. It was a good sign to see a silver fish in the river and I felt there had to be more so we persisted. As you can see from the awesome fish in the photo’s we had an absolute ball landing ten fish for the morning using small naturals. I am very impressed with some of the Jack fish coming into this system and it should be an amazing year if this continues. The condition of the fish are first class and the fight in even the smaller fishÂ is startling. We fished this water from 7am or so till 12 and did not see another car or angler the entire morning, I could not believe it. With the river being so low and clear I expect these fish to really be moving quick and it will be just luck if you are in the right spot when they go through . If you are lucky enough to be here for some of thisÂ sport it will be the best day of your years fishing !! You wont catch them if your not outÂ trying. Fishing backcountry in the next few days with some Aussie lads so will get a report to you by the end of the week , im sure it will be good.